Good god what a week. In the midst of scrambling wildly to get this book done and get ready for AX, we had to have a middle of the night emergency vet visit when we discovered that Myst, our old cat had a horrible boil. Thankfully it’s been healing after a treatment from the vet, antibiotics and a lot of attention/care that SHE DOES NOT WANT. Myst is a strong willed, ornery cat who HATES medicine. The first few days went all right, since she was weak from the whole experience and on sedatives and pain meds. But now that she’s getting her strength back, it’s turning into quite a task. How an ill sixteen year old cat can put up THAT much of a fight is beyond me. 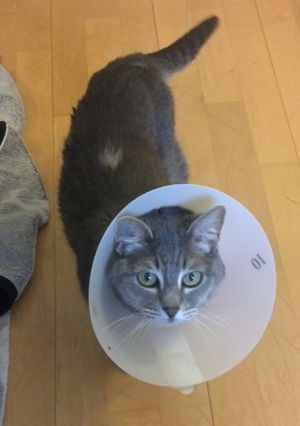 And then there’s the Elizabethan collar which she still hasn’t learned to navigate in and is regularly getting her stuck around corners or doorjambs. Anyhow, THIS IS DONE OH MY GOD. Sorry I didn’t actually end up posting the progress on the social medias — I just kind of plowed through the entire project in a several day long blur of panicked work. But we’ve got the ball rolling to HOPEFULLY have these for AX thanks to our fantastic printer, RA Comics. We are still taking preorders and will be for the rest of the week! We’ll go ahead and take them until the end of Anime Expo since we won’t be home to take things down anyway, so you’ve got until July 2nd if you want to get your book (or bundle) with the Yuki bookmark for free! We do also have some sketches left if you’d like to get one with your book. Please keep in mind that you will NOT be able to pick up preordered books at AX and we won’t have the bookmarks available til after the convention. SO YEAH ANIME EXPO THIS WEEKEND. Roll call, who will be there? Be sure to come see us in the artist alley this weekend — we’re way in the back, aaalll the way in the left, by concessions and the restrooms. We’ve got two tables so we’ll have a nice big booth that’s hard to miss. Aside from our usual assortment of badges (and some new designs) we’ll have Shounen Fight comics, magnets and prints. And as usual, if you swing by the booth to tell us you’re reading the comic, you’ll get a free sticker! We’ve got a new Shounen Fight book in the works! We’re taking preorders for book four of MSF, Emancipation Infiltration until July 3rd. If you’ve been waiting to pick up our silly magical boy comedy, this is a great time to do it! You can get all four books for $24 and you get a free set of magnets! Or if you’re already collecting our comics, single books are $6. By preordering (either a bundle or a single book), you will get for free a bookmark featuring Yuki’s recently revealed battle costume! Shounen Fight is on hiatus until we get back from Anime Expo but we’re stoked to start chapter 5!The orders are being processed through our new, single store where things are really easy to navigate! Aside from being able to get Shounen Fight goodies, you can also pick up Scuttlebutt badges, posters and prints. Speaking of Anime Expo, IT’S IN TWO DAYS OMG. We’ve got a LOT of new stuff from last year! Like all of our popular Supernatural designs and a brand-spanking-new poster featuring the cast of Firefly. New commissions are still closed while we finally finish up our insane wait list — including you last folks who ordered original pieces from LAST Anime Expo. We’ll have most of those available for pick up AT AX. If you’re going to be at the con and are waiting for a commission, stop by the booth to pick it up or get a status update. Any commissions not picked up, we’ll be shipping out when we get back from the con. Aside from the usual Scuttlebutt paraphenalia, we’ll have lots of Shounen Fight goodies, including the new book, magnets and prints of the boys’ magical transformations. 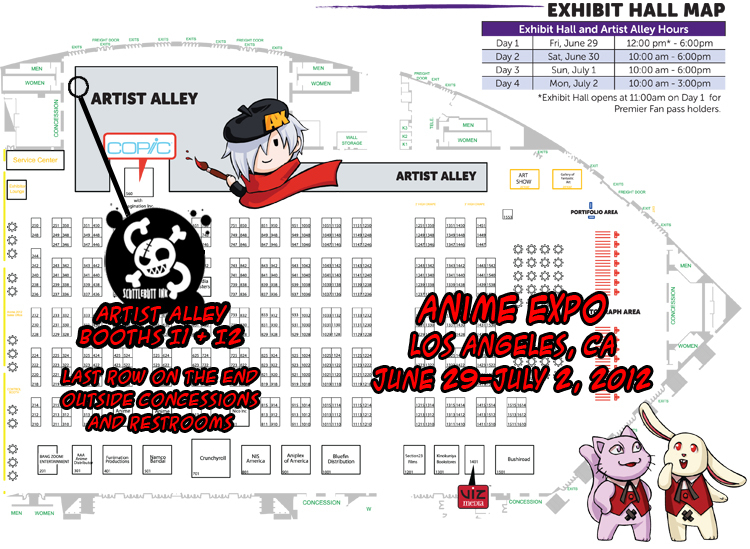 We’re in the far LEFT side of the AX artist alley, in the very back, on the end across from the concessions. Make sure to stop by and if you’re reading our comic, let us know and you’ll get a free sticker! The next big one is THE BIG ONE! San Diego Comic Con! 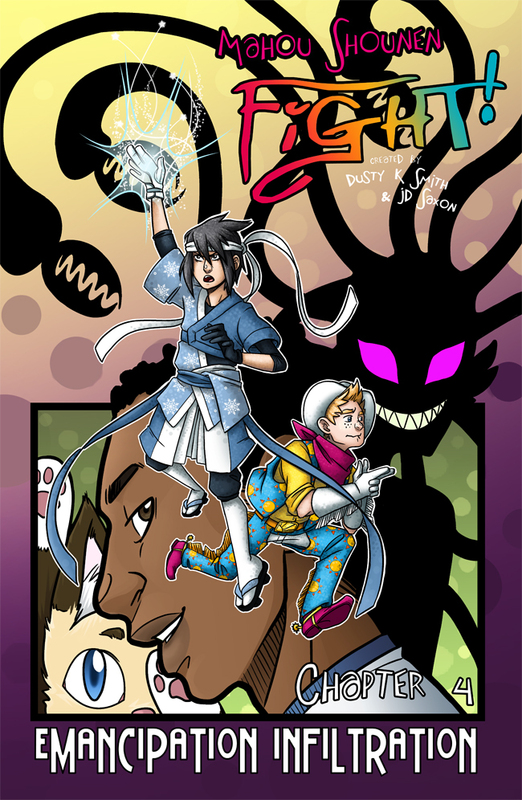 This year at SDCC we are super thrilled to announce that we will be exhibiting Shounen Fight with Prism Comics! If you’re not familiar with Prism, they’re a non profit organization that is all about LGBT comics and their creators and readers. They offer a yearly grant for queer comic creators, publish an annual guide to LGBT comics AND have a fantastic booth at San Diego Comic Con. We’re ironing out the final details but we’ll keep you updated with the final location — AND we’ll be sure to have a Comic Con exclusive or two for those of you who can make it by! As for the rest of the summer, extremely saddened to say that we’re not going to be able to make it to a couple of the regulars. Unfortunately, Otakon and New York Comic Con have switched things up in their artist alleys this year, rendering us unable to attend. On the other hand, we ARE excited to be hitting some conventions that we’ve beeing trying to make it to for years! San Japan in San Antonio and Nan Desu Kan in Denver, we’re looking at you! Also, I have a friend who works in a psychiatric hospital. She claims that pilling unhappy patients is easier than pilling unwilling cats. Good luck to you on that front. SO I just found and got caught up on this, and holy crap is this cool. BTW, dat cat. So adorable. Awesome!!! I love this comic, this has to be the fifth time I’ve read it over! XD I can’t wait till the 5!! Oliver is so freaking cute!! And so is Alex/yuki!! So freaking cute!! X3 Thank you so much for drawing this! July 6th… the anticipation is driving me crazy. My, my, MY, /MY/ it’s the 6th!!! Please don’t let Alex be a bad guy please no. I’m getting bad vibes and I hope I’m crazy.